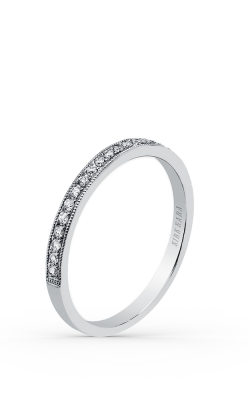 Kirk Kara wedding bands will enchant any newly married couple with their “Forever Captivating” brilliance. Marrying an old world European aesthetic with the sleek aesthetic of today, the brand dazzles with its intricate detailing. Kirk Kara adds the Karaguezian family’s legacy and personal touch into every collection presented by the sought-after designer. Colored gemstones, and sapphires especially, are an integral part of the Kirk Kara name thanks to their family’s history with the gemstone. Today, Kirk Kara wedding bands continue the legacy of handcrafted pieces that bring vintage style into the modern world. Medawar Fine Jewelers is proud to carry Kirk Kara wedding bands for our clientele. Because of the brand’s passion for perfection, Medawar Fine Jewelers carries seven collections of Kirk Kara wedding bands for men and women. The Angelique collection is romantic and feminine, with flourishing scrollwork reminiscent of flowers in the spring. With their marquise-shaped leaves made with colored gemstones, pieces in the Dahlia collection are delicate and elegant with a touch of color. Meanwhile, Pirouetta wedding bands “dance” around the wearer’s finger with a braided split shank ring band. Wedding bands from this collection truly envision eternal togetherness and love in marriage. 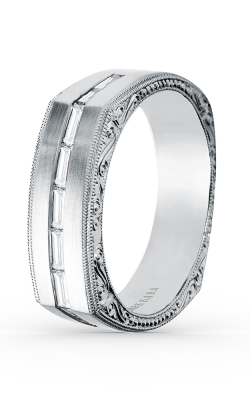 Kirk Kara’s wedding bands for men are compiled in the jewelry designer’s Artin collection. Handsome in their design and detail work, the delicate designs on each Artin ring are perfect for men who appreciate modern style with classic flair. The Medawar family has worked at the craft of jewelry and watchmaking for over eighty years. Since Chakib Medawar’s humble beginnings in 1920, the family has grown and passed down their heritage, improving their craft with every new generation. Today, Medawar Fine Jewelers are committed to serving their customers with impeccable service and ethically sourced materials. We provide the West Lansing, Okemos, Jackson, Portage, and Brighton areas with GIA-certified diamonds, timepieces, and bridal and fashion jewelry; we welcome shoppers from the greater Lansing area as well. For more information about our products and the services we offer, please visit your website or email us at info@medawarjewelers.com.